This is what is growing. Solidago 'Wichita Mountains' is supposed to grow to 30". Ours is 48" and loosely floriferous. It doesn't particularly like being planted on a slope, and high winds the other day laid it flat to the ground which, being downhill, resulted in both clumps being uprooted. When the rain/snow stops, I'll go fix that. I can't figure out how HCG managed to take a picture without a single bee in it, because they clearly love goldenrod. It is an important late season source of both nectar and pollen. The bees are feverishly making as much honey as they can, to take them through Winter. And packing away pollen, too, so that it will be available in February when the Queen is actively laying again yet no fresh pollen (baby food) will be available. Speaking of goldenrod pollen... if you're thinking, "Goldenrod? Just looking at it makes me sneeze," think again. It's actually ragweed that causes Autumn allergies, as it's pollen takes to the air easily. Goldenrod pollen is heavy and sticky making it not readily airborne. It's almost as if it were designed for the bees to collect and disseminate. 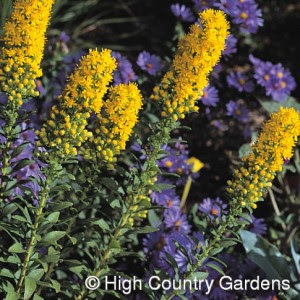 If you're into flower gardening and honeybees, I highly recommend Solidago 'Wichita Mountains'. It doesn't need much water, takes full sun, and is freely flowering at a time when little else is. Its spiked, usually upright form looks great with densely mounded purple New England Aster, another honeybee favorite. Just remember, it's a back-of-the garden type of plant that will need to be cut down each year to keep it tidy.